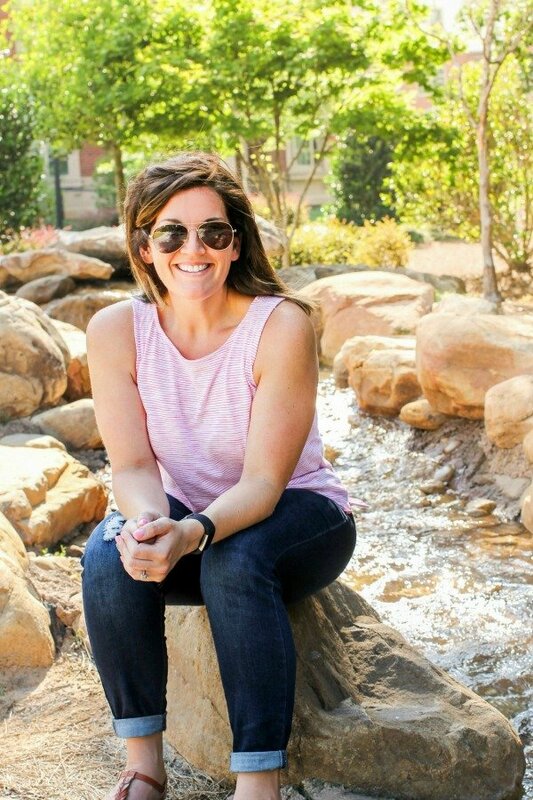 April 10, 2019 By Allyson 12 Comments This post may contain affiliate links. Read my disclosure policy. 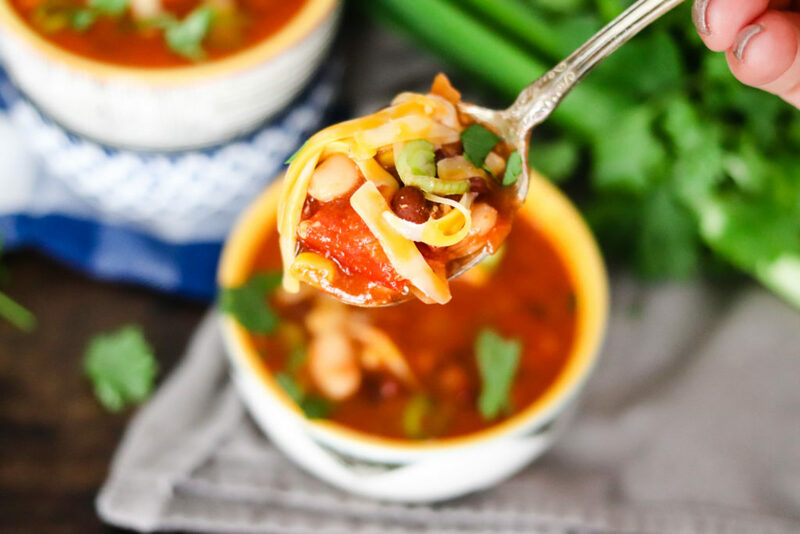 Instant Pot Enchilada Soup is hearty and delicious, yet low calorie and vegetarian. Most of the ingredients are pantry staples, and it’s very inexpensive as well! 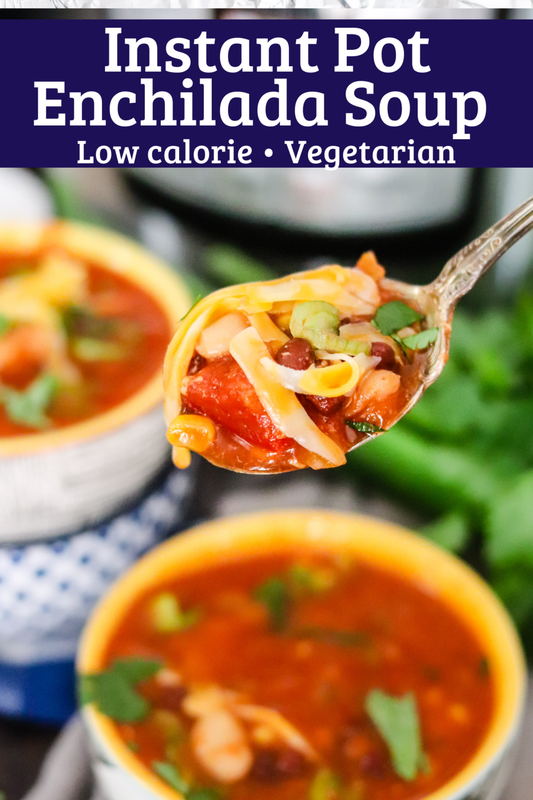 Instant Pot Enchilada Soup is one of my favorite meals because it’s super simple to make, most of the items you can find in your pantry, it’s low calorie (great for healthy meals), and you can make it in the Instant Pot, on the stove top, or in the Slow Cooker. This is a recipe that takes no effort and everyone will love it. I’ve been making it for years and am so happy to convert this enchilada soup to an Instant Pot recipe! Enchilada soup is SO easy to make! You can see here how to make it in the SLOW COOKER or on the STOVE TOP if you don’t have an instant pot (although you need to buy one!). I also LOVE this recipe because it’s just ONE POT! BOOM, done! Want to add meat? Scroll down for instructions on how to add ground chicken or turkey to enchilada soup! Add the canned ingredients to the Instant Pot. Add water, onion, cumin, and red pepper flakes. Stir everything, then close the lid and make sure the valve is in the sealed position. Set the instant pot on high or manual for 5 minutes. Remember when using the Instant Pot, that the time it takes to cook the recipe (5 mins), is not the total time of the recipe. You need to give the pot some time to ‘come to pressure’. Since there is a lot of liquid in this soup it could take 10+ minutes. After the time is up, let the pressure release naturally for 5-10 minutes. This will prevent liquid from splattering out of the pressure valve. Carefully flip the valve to release the rest of the pressure, then remove the lid. Add the frozen corn, cilantro, 1/2 cup of cheese, and cilantro if desired to the instant pot enchilada soup. Stir, close the lid and let sit for 5 minutes. Serve and garnish with your favorite toppings such as more cheese, green onions, avocados, tortilla strips, and cilantro! Greek yogurt is yummy too! I like to double this recipe and freeze extra! It’s easy to pull out during the week for meals. One the Instant Pot Enchilada Soup has cooled, add 3-4 cups to quart size freezer bags. Seal the bags, pressing out any air from the bag. Place in the freezer laying down to save space. To defrost, remove from freezer and place in fridge the day before eating. For day of defrosting, set on counter in a shallow bowl or plate. Yes! 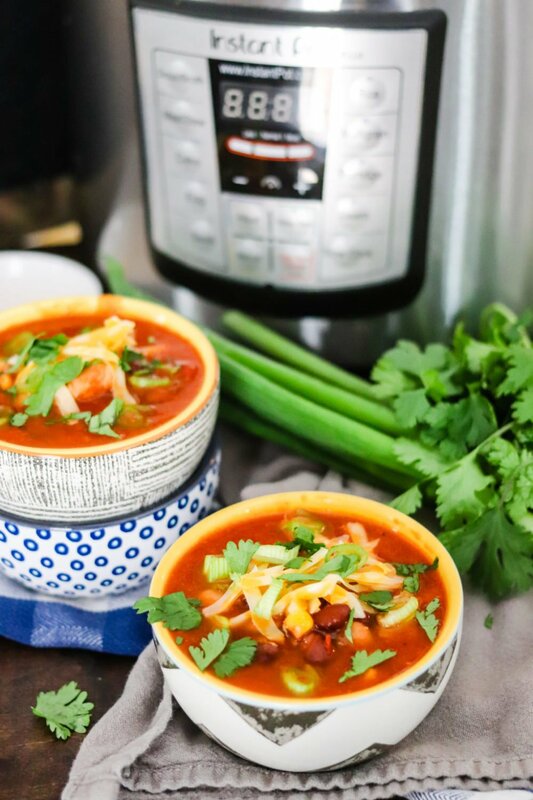 Instant Pot Enchilada Soup is very healthy! It’s a vegetarian meal that is low calorie. You could also add ground turkey or ground chicken to add additional protein. This recipe makes about 6 servings. For each serving it has 229 calories, 2 grams fat, 42 grams carbohydrates, 12 grams of fiber, and 14 grams of protein. With 12 grams of fiber, this packs nearly half of your daily fiber. 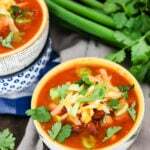 This Enchilada Soup is also high in potassium, Vitamins A & C, and calcium and iron! While this recipe has 1000mg of sodium, you can reduce that by making sure to use no-salt added sauces, beans, and tomatoes. Make sure you also rinse the beans to reduce the sodium. It also has 28% of the daily recommended protein without containing meat! Before adding anything to the instant pot, turn the pot to saute mode, then spray lightly with non stick spray or a bit of oil. Add 1 pound of ground chicken or turkey, and saute for 5-6 minutes, or until mostly cooked through. Follow the directions adding ingredients to the pot and cook as instructed. The Best Instant Pot Hard Boiled Eggs are so easy to make! Done in a few minutes and super easy to peel, you’ll never make them any other way again! Instant Pot Loaded Mashed Potatoes are full of cheese, bacon, and green onions! Ultra creamy and delicious, these are the best loaded mashed potatoes! Instant Pot Baked Potatoes are done in a fraction of the time as traditional baked potatoes, and are the creamiest baked potatoes you will ever eat! Instant Pot Garlic Hummus has only a handful of ingredients! Save money and know exactly what’s in your food with this recipe! Instant Pot Cilantro Lime Chicken is an easy healthy meal that comes together in less than 30 minutes! Great for tacos, salads, rice bowls, or just plain! Instant Pot Sweet Potatoes are the perfect easy side dish! Save time using the Instant Pot, then load them up with delicious toppings for a healthy meal! This CRISPY SKIN HACK is AWESOME!! 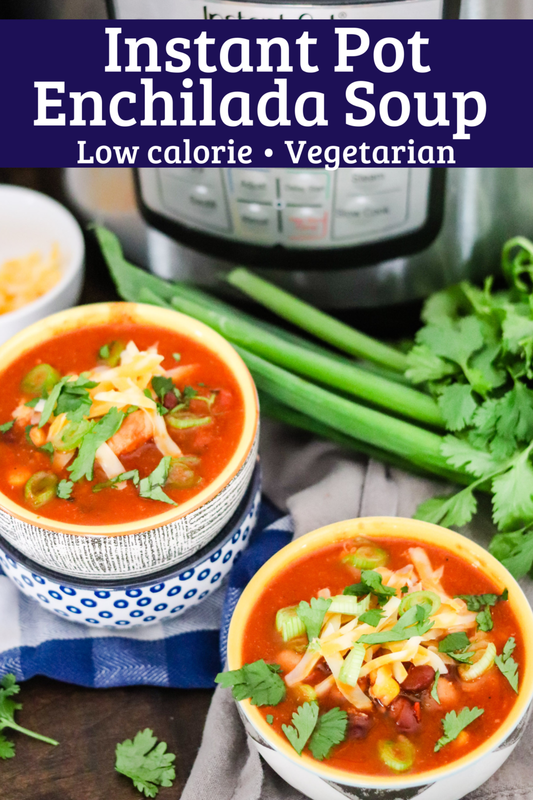 Instant Pot Enchilada Soup is hearty and delicious, yet low calorie and vegetarian. Most of the ingredients are pantry staples, and it's very inexpensive as well! See options to add meat as well as cook on the stove top or in the slow cooker! 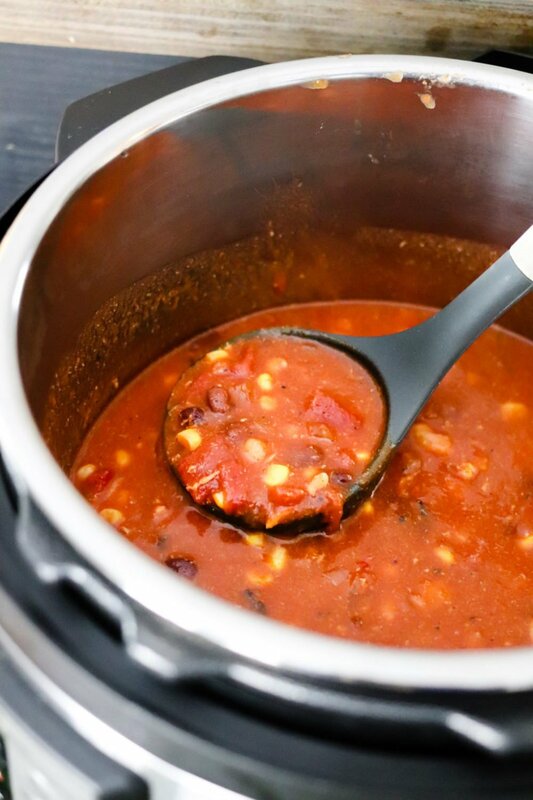 Add tomato sauce, enchilada sauce, black and northern beans, fire roasted tomatoes with liquid, water, onion, cumin, and red pepper flakes to the Instant Pot. Stir everything, then close the lid and make sure the valve is in the sealed position. After the time is up, let the pressure release naturally for 5-10 minutes. **This will prevent liquid from splattering out of the pressure valve. ** Carefully flip the valve to release the rest of the pressure, then remove the lid. Add the frozen corn, cilantro, cheese, and cilantro if desired. Stir, close the lid and let sit for 5 minutes. Want to add more protein? Continue with directions from the beginning. For each serving it has 229 calories, 2 grams fat, 42 grams carbohydrates, 12 grams of fiber, and 14 grams of protein. 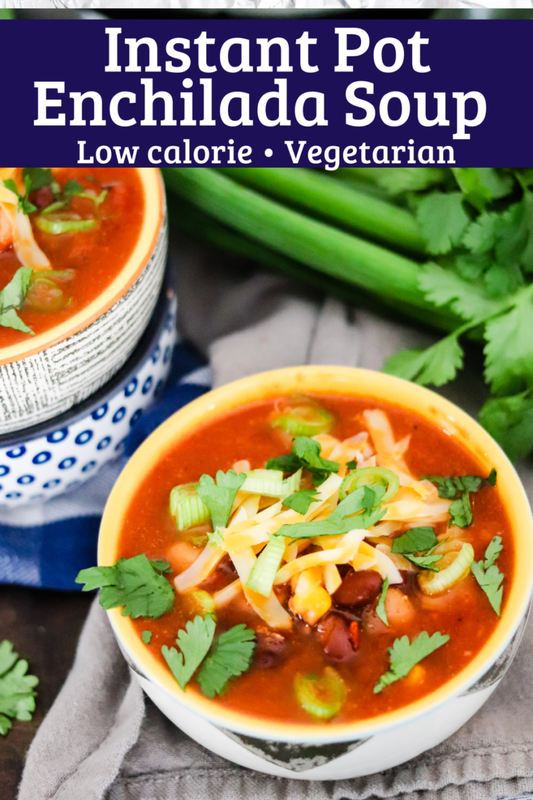 I love enchilada soup – this one was a huge win! This is a great instant pot recipe! I definitely needed this one. Not only is this a great Instant Pot recipe, it’s also low calorie! Yes.. I cannot wait to make this. Yum, yum!! Easy, quick, & so many great flavors! Thanks! Seriously how perfect is this soup? I love enchilada soup! You have inspired me to make this for dinner tomorrow; your recipe sounds amazing! Oh how YUM. Such delicious and comforting flavors in this soup! This soup will be perfect for dinner tonight. This soup looks like the perfect meal for my family! Everyone will love it! This soup looks fantastic! Love all the flavors and I it’s something new to make this weekend! So easy and delicious! Love that this is made in the instant pot! Mexican soup is my favorite nothing like soup with a kick! I love how comforting it looks! So delish!